My oldest daughter, Miss K, was going through my scraps the other day and mysteriously ended up with a giant pile of pinks and reds. She must have Valentine’s Day on the brain!! I thought it would be fun to put together a little string quilt to utilize these little bits of goodness. 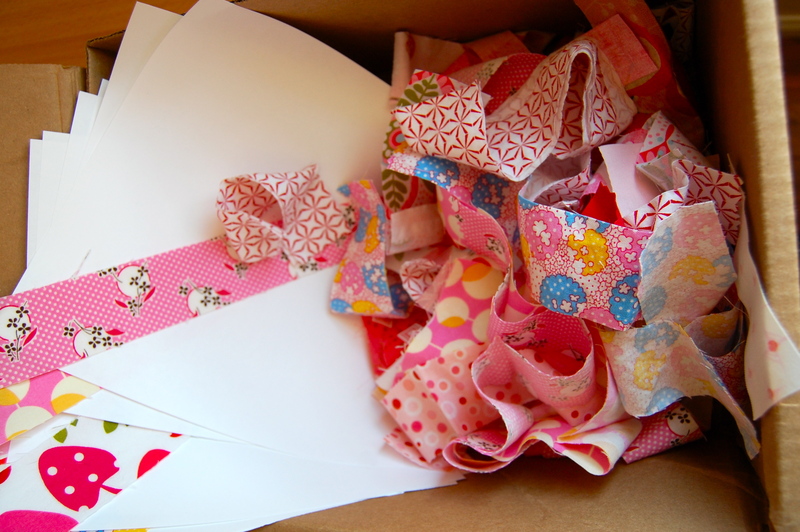 I do have an insanely large amount of pink scraps, it’s time I start making room for more. 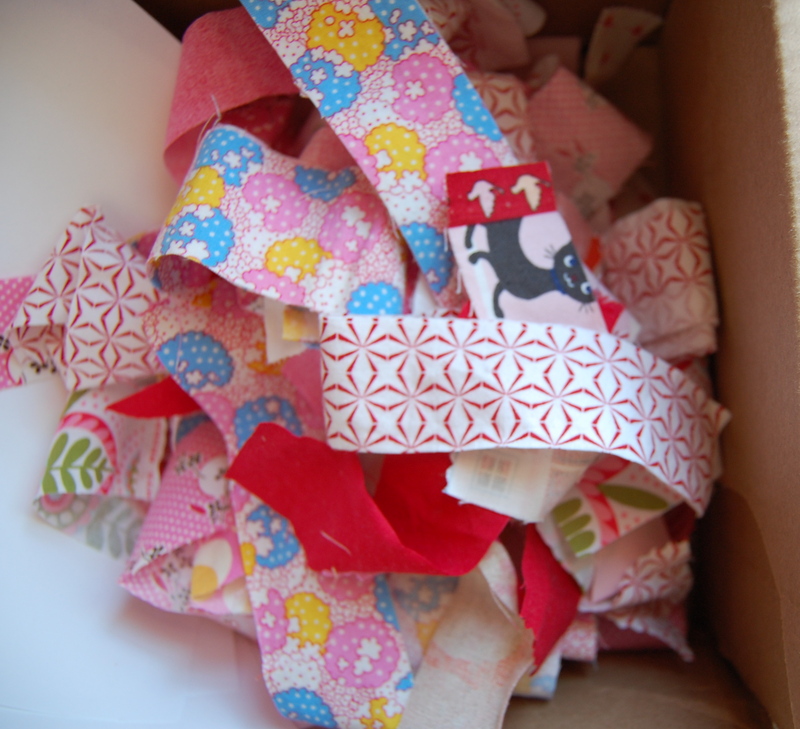 The red scraps were a bit harder to find but we managed to muster a few. I have a few other projects that really need to come first, but this one was so fun and easy to work on, before I knew it I ended up with about half of a baby size quilt. Maybe one of the two lovely mammas I know who are pregnant right now will have a baby girl. This won’t be finished by V-Day but I could probably pull it off by their summer due dates! 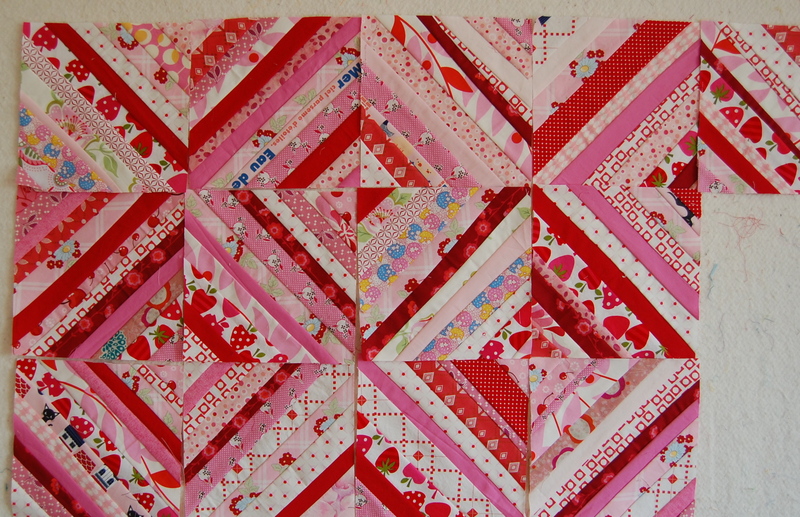 My other litle purely indulgent project is my Echino Punch Log Cabin Quilt that is coming along very slowly!! I think I’ve decided to randomly place the blocks in a “sea” of Kona pale flesh and bone, to make for another very “improv-y”mixture of color and piecing. Not entirely sure about this one, but I’m just going to go for it and see what comes of it. FYI- Colors are REALLY off in this last photo, I promise it’s actually prettier in person) :-)!!! I’m linking these little WIP’s up to Lee at Freshly Pieced WIP Wednesdays. Go on over and have a peek at all the other fun projects happening around bloggy land. 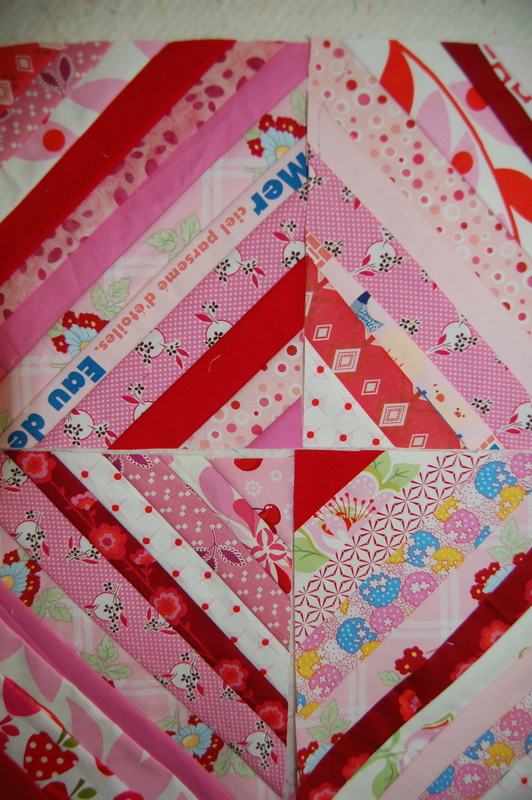 Love your log cabin quilt! That’s going to be great. The colors are perfect. Thanks so much, I’m really having fun with these colors. I’ll hope to finish this top soon but it’s slow going so far!!! Your string quilt looks great. It’s such a great way to use up all those little scraps. These are gorgeous! 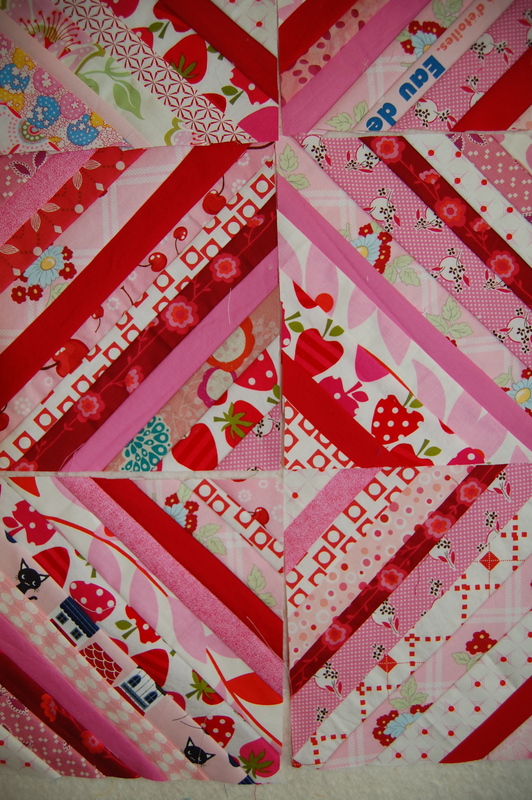 I love the reds and pinks in the string quilt top. 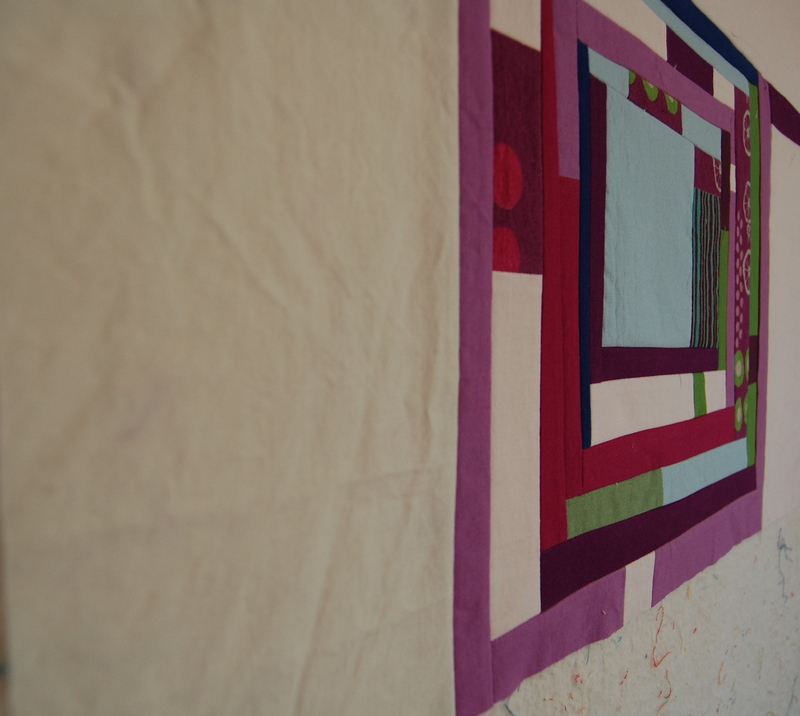 And the log cabin quilt is going to be so beautiful. I can’t wait to see you pull these together. Simply lovely! the red and pink strings are lovely together! 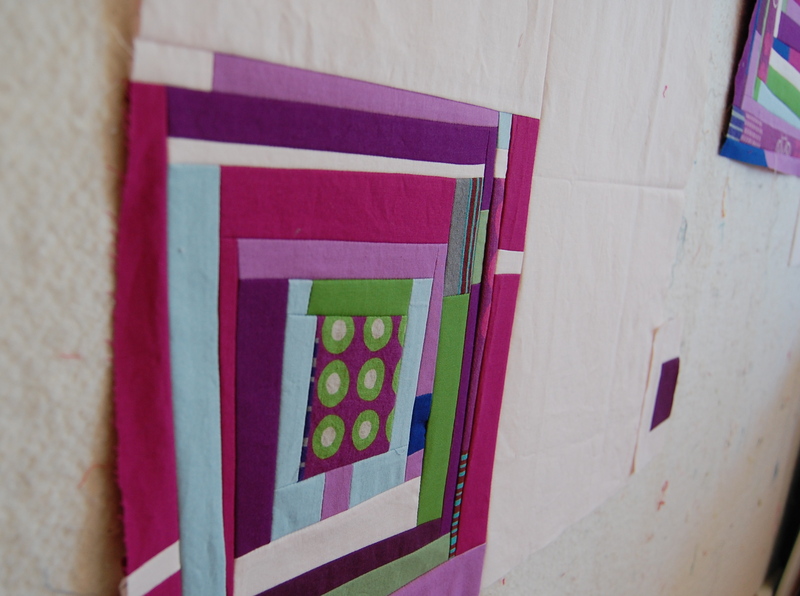 i love the purple and green and echino blocks, too. though, i can’t say i would have chosen pale flesh to go with them. i’m curious to see how this one turns out! Thanks Melinda!! i’m not sure about the pale flesh either to be honest, like most of my quilting choices it was pretty impulsive!! The top is actually done and I ~think~ i like it! I always feel like i like them better once they are quilted and bound…. hopefully soon. Like you, I have been spending more time knitting and less time quilting! !